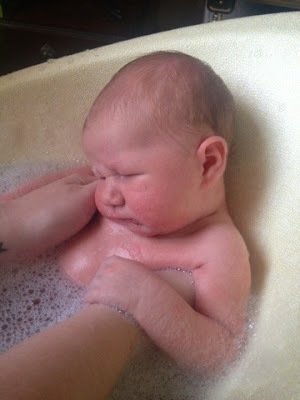 A few months back I was offered the chance to review the fantastic new baby bath from Shnuggle. All I had to wait for was baby! The Shnuggle bath is no ordinary baby bath, not only is it beautifully designed but it is very cleverly thought out to support baby at bath time. The bath is made from a soft and tactile baby safe foam making it both warm and soft to touch. It is kinder to baby's skin with great insulation that keeps the water warmer for longer. The material is a super-strong polypropylene foam, which is extremely lightweight and durable. The best feature about the bath is the bum, bump and back support which aims to make baby feel safe and secure and avoids the slipping and sliding that is common with many other baby baths. Like I said I have waited a long time to try this out and was it worth the wait? In all honesty it definitely was! As anyone who has ever bathed a newborn baby before will know, they are quite slippery and the Shnuggle bath really makes it easier to hold them without difficulty and it must be comfy as every time we have used it Elsie has immediately relaxed and fallen straight to sleep. 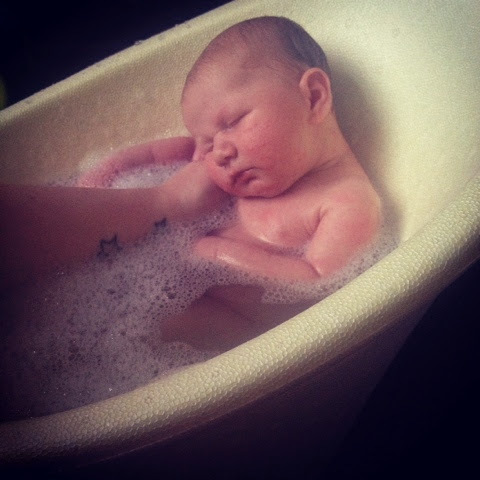 It especially made it easy for me to bath her without help post c-section, which I would have struggled with using any other bath. I love how you don't need a large amount of water in the bath due to the shape and size making it easy to carry when filling and emptying. The water definitely stays warm longer meaning I can let her stay in there a little longer while she's enjoying it! I've never known a small baby who loves their baths as much as she does. The only downside of course is the fact it is only suitable until around six months for most babies (dependent on size) but the majority of people will be happy to bath a baby in the main household bath by six months. I know we will be happy to do so. This is definitely one of those products you don't know you need until you try it! I certainly wouldn't be without it now and will be recommending to all my friends and family. The Shnuggle baby bath comes in five pastel colours; Ocean, Mint, Pearl, Buttercup and Rose and is available to buy on the Shnuggle Online Store for £30. You can catch up with the latest news from Shnuggle on their social media pages below. I was sent the product featured free of charge for the purpose of this review. All opinions are my own. Everyone baths a child in a sink at some point in life. Although I do remember my grandma always washed my hair in the sink growing up! They really are! I wish I'd had it for the other two. She is! And I do love these photos. Great first bath pics!